Now that the winter is rearing it's head, the wells and springs project I have been working on over the past five months is finally being wrapped up. Over this time I have met a lot of great people, done some really interesting interviews, seen and measured dozens and dozens of wells, and learned a lot about traditional water sources here in Newfoundland and Labrador. And now that everything is coming to an end, I want to share with the blog what it is I have accomplished, and what's coming next! At the most basic, water is crucial for daily life and survival, and so the majority of the traditions and folklore that I came across fell into three basic categories. The first is daily life, which includes securing, collecting, and cleaning your water sources. The second is community, which covers elements of protection, safety, and tragedy, and support between families. The final category is spirituality, which appears in a few different ways. 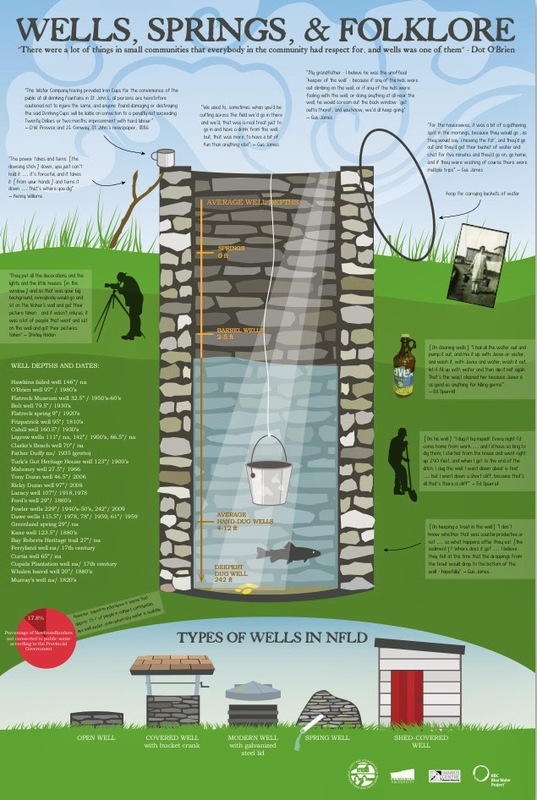 These different categories mean that there are lots of different stories, traditions and folklore surrounding wells and springs in the province. My favourite tradition around daily life is the trout in the well. All summer I hoped and actively looked for a trout in a well, and while I heard lots of stories and memories about their being trout down in wells (and one great story about a trout being fished up and fried) it took my until late in the summer to finally see one, out in Carbonear. 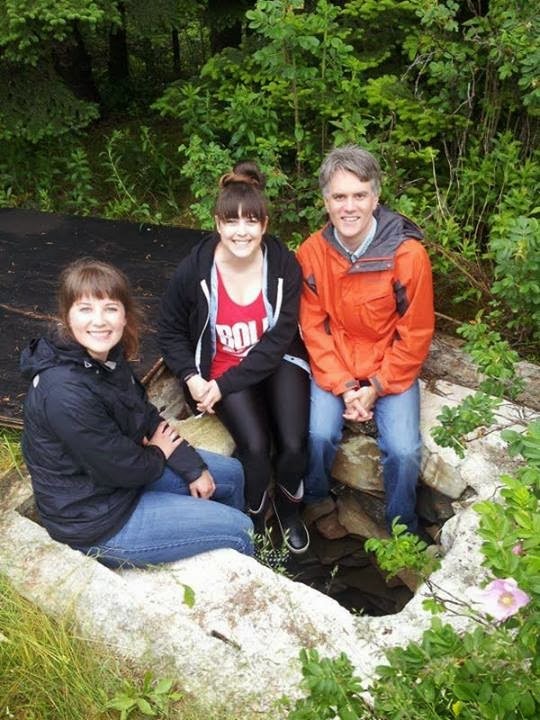 The owners, the Fitzgeralds, have had trout in their wells for as long as they can remember, and the current one had been own there for almost 10 years! One of the last traditions I heard about communities was one from Shea Heights, where families would gather on a communal well in front of the general store to take photos, or kids would meet there after school to plan the afternoons activities. Wells represent not only a water source, but can also mean a gathering place in the community, a location accessible and recognized by all. This is my favourite community folklore memory around wells and springs - the imagery of men, women and children gathered around a public well to gossip, take photos or play is a great one, and reminiscent of a time when life wasn't as busy or distracting. The most endearing memory I hard around the final category, spirituality, had more to do with personal attachment than religion, and that was the stories of loved ones on death beds requesting water from a particular source. The best story was one which said that when their mother asked for water from a well far out of the way, they tried to skip a long trip to an old spring by bringing a grandmother water from somewhere else, but she could tell the difference, and sent them on their heels for the real thing. Of course throughout the last few months I updated on my progress through the blog, which you can find in the archived blog posts by searching the keyword "wells" or "springs". I also wrote articles for the July, August/September and the October/November ICH Newsletters, available to read on the DAI website. One of the first end goals we decided upon with this project was to create an infographic which neatly displayed all the interesting factoids and stats about wells and springs in one poster. Graham Blair did an amazing job taking my stats, measurements, quotes and imagery and turning them into a really grand looking display of everything I had done! Finally, I've had the opportunity to share my work in a unique presentation style at a presentation through the Harris Centre at the end of last month, call a Words in Edgewise 20/20 presentation. This is essentially a set of 20 slides that cycle every 20 seconds out of your control, so while you're presenting you have to keep up! I will be presenting this work again at the ICH mini forum next month, which is open to the public through RSVP with me or on Event Brite. Information for both of these can be found here. The biggest lesson I learned through meeting everyone and seeing all I did this summer is how important water really is. As someone who has always had the luxury of turning on a tap any time I was thirsty, I never really thought about how important it was to protect and care for your water. I met several people who had experienced dry wells, or were going through it when I visited, and had to deal with the issue of wondering where your water was going to come from. I have a much greater understanding and respect for water that I didn't have before.